To start the vehicle with our kit simply hit the lock button 3X on your factory remote, that's it! The installation of this product will require anywhere from 2 to 6 wiring connections depending on how you want to configure the system per your liking. We will provide precise directions with wire colors and locations in the manual and in additional info upon request. Please note: A person with a good basic knowledge of wiring 12 volt car electronics should be able to install this product successfully - Our remote starts are ONLY compatible with AUTOMATIC transmission vehicles. We also sell manual trans setups, Email for more info regarding those if interested. Wire ties and t-taps are also included to complete your installation. Preloaded module & T-Harness combo for 2007+ Nissan and Infiniti Push-To-Start vehicles. The EVO-NIST1 is the ultimate Factory Fit, ALL-IN-ONE data immobilizer bypass, doorlock, alarm & remote start interface with T-Harness combo module for 2007+ Nissan & Infiniti Push-To-Start vehicles. It raises the standard of hassle-free installation convenience to a whole new level. It uses a multiple bus architecture with 10 separate communication ports that provide more complete functionality on every supported vehicle. 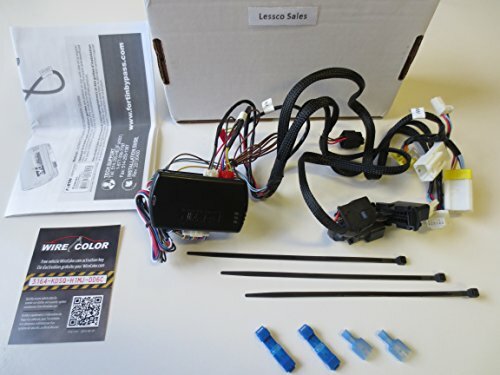 This is a genuine Lessco product prewired and designed specifically for the vehicle listed. All the prep work is done, Leaving you you more time to enjoy your new remote starter! Free proprietary copyrighted text style wire code sheet available upon request, Just ask. Please note the year make and model and key/starting method type. Activates from existing Factory Remote. (VEHICLE MUST HAVE OEM KEYLESS ENTRY) Press the lock button on the OEM Remote 3 times to activate remote start function. Latest firmware guaranteed. Upgradable to extended range RF kits and/or drone smartphone module (if applicable). Printed as well as electronic delivery of the installation guide will be sent to you after checkout. Easy install typically 2-6 connections depending on your preferences. If you have any questions about this product by Lessco, contact us by completing and submitting the form below. If you are looking for a specif part number, please include it with your message.